What if you have a dream that seems to warn of danger? Does the dream necessarily imply that trouble is on the way? If you’ve had dream imagery that is ominous and you wake up feeling alarmed, should you remain on high alert and take all precautions against an imminent disaster? The following short dream was related by a building contractor who was hoping for answers to the above questions. A dream about gas in a PVC pipe. So, I’m in the structural part of a house—maybe near a staircase going up out of a basement. I’m looking at two-by-fours and other kinds of framing. Then I notice a one-inch PVC [plastic] pipe. It’s white and really typical looking. 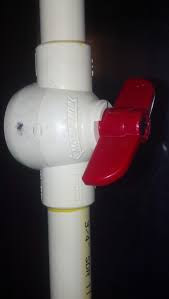 Just before the end of it is a red shutoff valve. At first it looks like the valve is in the “off” position. But then I hear a bit of hissing. That’s when I realize that the pipe is not carrying water, but natural gas. Gas is slowly leaking out the end of this pipe. That can be lethal, so I check the valve to see if maybe it’s not completely in the “off” position. It turns out that it is completely in the “off” position, and still gas is getting out. At the same time, I am really concerned because a gas line should not be made of plastic; it should be metal. In a fire, the plastic would melt, and that could result in real trouble. I often discuss the concept of the waking dream in this blog. It is the idea that the dreaming process does not stop when we wake up in the morning. Any image that we encounter during our normal day is also a dream. When the image is startling, that’s when we need to pay attention to it. For example, suppose we’re driving to work and have a near-miss with another vehicle. We are left shaking and in a cold sweat. Even though it happens during the day, that’s a dream. Prophetic dreams—ones that we have during slumber and that later come true in “real” life—are nothing more than dreams that happen first during sleep, and then repeat themselves in our awakened state. It’s the same phenomenon as having a recurring dream, only with a prophetic dream, the second manifestation moves to our daily, awake life. Mostly what a prophetic dream implies is that the dream content is important, so the message has been delivered multiple times. Granted, there are those prophets who are highly adept at this type of dreaming, and they can be of great service to mankind. For the rest of us, the trick is to understand the dream message the first time. Then it won’t have to repeat itself, “coming true” in our awakened state. We’ll discuss this more in the next post.